Acheson Creations was doing Kaiju before it was cool and has launched their Kaiju Kaos: Super Robot StratoMaxx Kickstarter campaign. When dreaming up Kaiju Kaos in late 2009, I had four core colossal characters in mind; three were kaiju and the fourth was the heroic Super Robot designed to combat the menacing monsters. As time passed, we’ve released numerous kaiju but the robot kept getting pushed to the back of pile… until now! 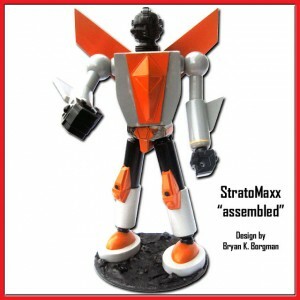 The primary goal of this Kickstarter is to fund Super Robot StratoMaxx.